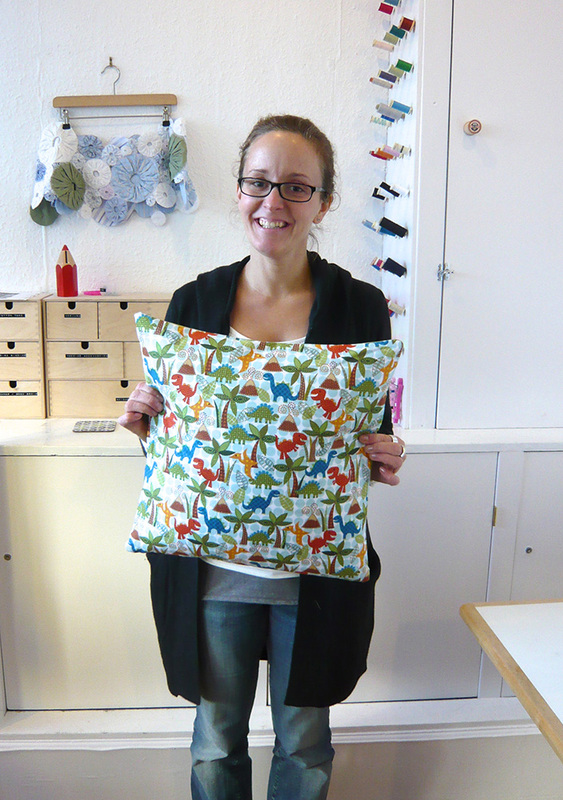 Here’s Larissa with her first cushion of the day – an envelope back cushion in a very cute dinosaur print fabric made as a present. Her second was one for herself with a zipped seam. Larissa hadn’t sewn for a number of years before the workshop and wanted something to get her back into sewing again. Judging by the lovely results she achieved I think she’s found it! 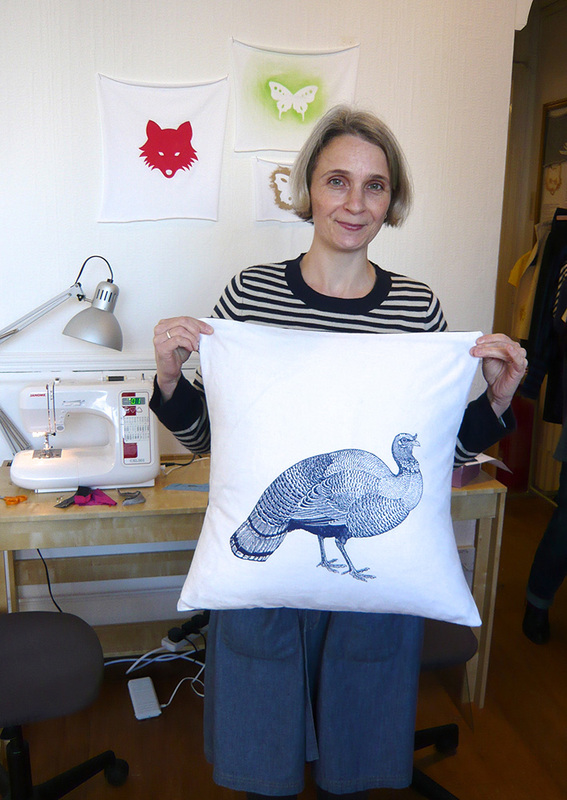 Here’s Joy looking very pleased with her new cushion cover. Joy has been sewing for a long time and given a chance will hand sew everything, I think she quite enjoys my nagging to use the sewing machine though (!) 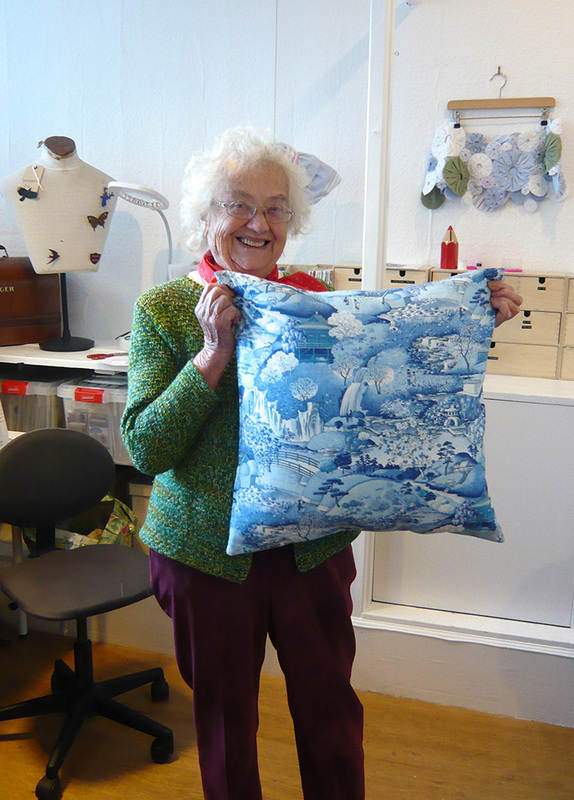 and was very happy with the neat zip on this cushion cover and the speed in which she finished it. She took home another cushion cover cut out and ready to put together. 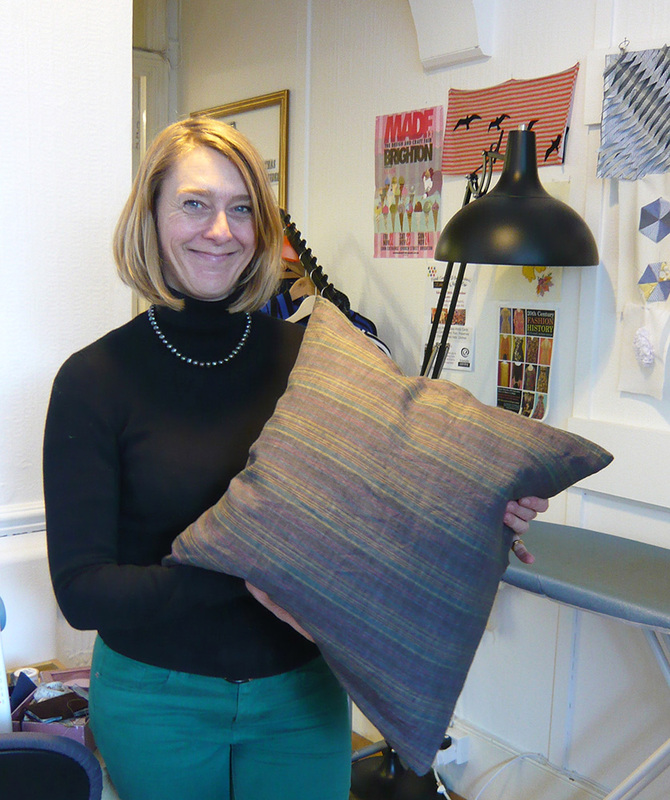 Elizabeth was on a bit of a mission to make 2 complete sets of cushion covers at the workshop using this striped linen in lovely muted colours from Ditto. After a bit of head scratching between us to try and get as many cushion covers as we possibly could from each fabric, she got 4 cut out and sewed up 2 of them. Very impressive! The front of Sam’s cushion was originally a tea towel. We all agreed – far too nice to dry the pots with! She has a set of them so wanted to know how to turn them into cushion covers. She finished this one in the workshop and will no doubt soon have the full set. She also made a start on a zipped box cushion for a chair seat. Not bad for a day’s work. Last, but not least, Laura embarked on the most ambitious cushion cover of the day which included; a zip, a patchworker front to include a piece of machine embroidery she had previously done and some piping around the edge using a continuous bias strip cut from one of her fabrics. She got the bulk of it finished at the workshop with just the piping to attach in the seam around the edge. She’s on a promise to send me pics of it when it’s finished! 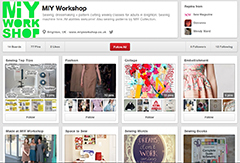 This entry was posted in Full Day Classes, MIY Workshop, Student work and tagged cushion making brighton, cushion making workshop, cushions, learn to sew brighton, MIY Workshop, sewing classes Brighton, Wendy Ward. Bookmark the permalink.